Could Pepsi or Cola Give You Cancer? Home » Cancer » Prevention » Could Pepsi or Cola Give You Cancer? Of the popular beverages around the world, Coca-Cola and Pepsi generate billions of retail sales annually. However, in 2012, California passed a law mandating that all drinks containing a certain amount of cancer-causing ingredients must include a cancer risk warning on their labels. One such ingredient to be listed was the caramel coloring agent ammonia sulfite, or 4-Mel, which is commonly used in soda products. In order to curtail the mandatory cancer risk labeling, both Coca-Cola and Pepsi agreed to remove the 4-Mel from the sodas distributed across America. Despite this agreement, the Center for Environmental Health has revealed that only the Pepsi products sold in California have had the 4-Mel removed. However, the caramel coloring in Pepsi products sold outside of California still contain a worrisome level of carcinogens. Recently, the Center for Environmental Health recruited Eurofins Eaton Analytical, a lab company in Monrovia, California, to test Pepsi and Coca-Cola products from across the country. The results did not find any 4-Mel in Coke products sold in California, and 9 out of 10 Coke products sold outside of California were also 4-Mel-free. Although the Pepsi products sold in California (the only state where the mandatory cancer labeling applies) were free of 4-Mel, all ten Pepsi products purchased outside California contained levels of 4-Mel that were four to eight times higher than California’s stipulated safety levels. Pepsi states that their suppliers of caramel coloring are currently changing the manufacturing process to cut the amount of 4-Mel in its caramel coloring, and that although the process is complete in California, it will not be fully complete in the rest of the country until February 2014. In addition, Pepsi states that it has plans to remove 4-Mel globally; however, they have not indicated a timeline for when this will actually happen. Surprisingly, the cancer risk of 4-Mel is not only associated with drinking soda products. 4-Mel can form while cooking, which can lead trace amounts to be found in numerous food products. At the moment, regulatory agencies such as the FDA, Health Canada, and the European Food Safety Authority consider the trace amounts of 4-Mel found in food and beverages to be safe for human consumption. The American Beverage Association also believes that the levels of 4-Mel found in Pepsi and other food products is safe, and points out that no studies have linked 4-Mel to cancer in humans. California’s decision to add 4-Mel to its list of carcinogens was based on a study that was conducted on lab rats. 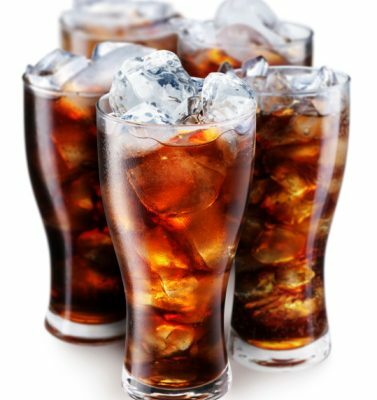 The FDA points out that a consumer would have to drink upwards of 1,000 cans of soda per day to reach the doses that were linked to cancer in rodents. Although more human testing is needed which links 4-Mel to cancer, the carcinogen is still considered toxic when consumed. A similar carcinogen (2-Mel) has been linked to liver, thyroid, and lung cancer. Moreover, Time Magazine reports that there are roughly 130 micrograms of 4-Mel per 12-ounce can of soda, and that the average American drinks 14 ounces or more of soda per day. Contrary to the FDA, California regulators claim that ingesting more than 16 micrograms of 4-Mel per day could pose a significant cancer risk. Even if soda companies remove 4-Mel from soda, the high fructose corn syrup, sugar, artificial coloring and sweeteners used in most soda products still remain. These ingredients have all been previously linked to an increased cancer risk. So if you make one baby step towards optimal health today, vow to toss out the soda – your body (and your waistline) will thank you!